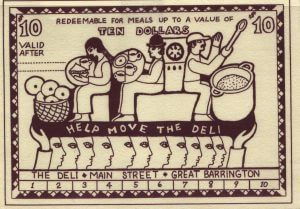 1989: Deli Dollars issued by Frank Tortoriello, designed by Martha Shaw. 1991: Berkshire Farm Preserve Notes issued by The Corn Crib and Taft Farm, designed by Martha Shaw. 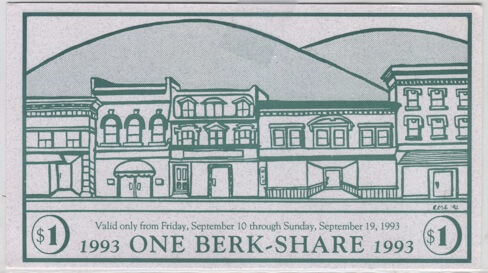 1993: "Berk-shares", precursor to BerkShares, issued by owners of local businesses in downtown Great Barrington. The only collection of its kind in North America, the Local Currency Archives contain a wide variety of materials gathered from over fifty different alternative currency projects around the globe. The collection represents the work of hundreds of community activists and leaders in the field such as Paul Glover of Ithaca HOURS and Thomas Greco of Tucson Traders. An invaluable tool for both researchers and citizen activists, the LC Archives make possible the comparative study of various currency models such as TimeBanking, barter systems, and HOURS. Perhaps most importantly, the internal documents, newsletters, and correspondence contained within the archives chronicle the efforts, trials and tactics of those working to bring economic exchange back under regional and community control. The Local Currency Archives are electronically cataloged here and can be found by searching for the keyword "Local Currency." The Local Currency Archives are growing. If you have or currently are managing a local currency project, please consider donating originals or copies of newletters, directories, printed currency, internal documents, media coverage, research papers or any other materials that might be valuable to those researching local currencies or working to start one of their own. 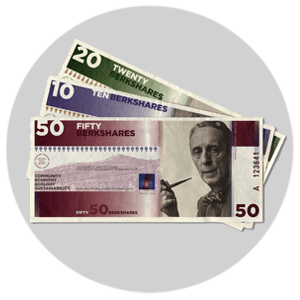 To learn more about the above examples of currencies used in the Berkshire region in the early 1990s, visit the Local Currencies Program page. Includes the E. F. Schumacher Archives and the Local Currency Archives. To isolate and search Local Currency Archives, use the search term "Local Currency Archives." Please note that both the E. F. Schumacher Archives and the Local Currency Archives are currently cataloged on the Schumacher Center Archives database. Use the search term "E. F. Schumacher Archives" or "Local Currency Archives" to isolate and search the individual archival collections. Refer to the Selected Keyword Index for sample search terms. Please note that while the Selected Keyword Index contains most of the documents’ descriptors, some keywords are not listed; nonetheless, you should be able to access any document through one of its multiple keywords. Understand variations in our labeling system. The documents in the Schumacher Center Archives are cataloged using a unique labeling system which corresponds to the physical location of documents in the library. As such, you may ignore the location unless you intend to visit the Library and view the documents in person.